Welcome to another chapter in the life of the Parfitts. As you may have noticed I have broken tradition and have combined two months together. There are two simple reasons. Firstly I have not had time to do them as separate months and my second reason is I have not had time. The last few months has been a little busier than we are normally used to, but am glad to say it is all settling back down again, hopefully back to some sort of normality, whatever that may be. 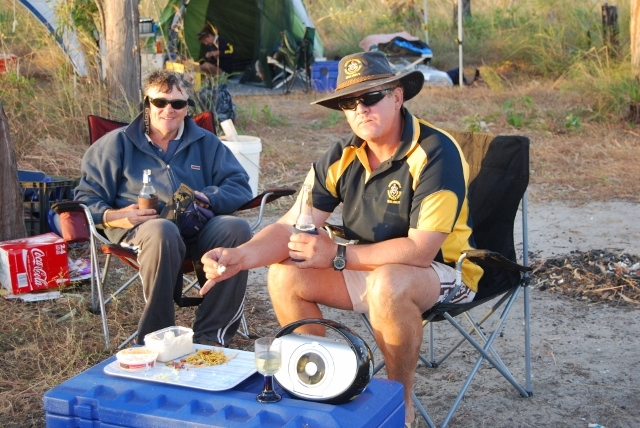 So when I left you in the April update Harry and I had just competed the marathon drive from Melbourne to Bundaberg in a ridiculously short length of time. This sort of madness is not recommended, believe me. We took the van straight around to our house in town (that we have rented to a very nice lady who gives us access whenever we want it) and the fun was about to begin. I had concerns about backing the van down the driveway with only Harry to direct me as it can be a bit tricky. He did a sensational job on the hand-held UHF and we had the van in the backyard on the first attempt. Our plan for the next week or so appeared to be fairly simple. We were going to stay in the van in the backyard so I could work on unpacking for as many hours a day that I could remain awake. We had access to the downstairs toilet and showered using the caravan's outside shower. It actually wasn't too bad as we had a quick nuddy shower after dark. One night it was actually raining and was rather pleasant having a hot shower with the cold rain falling on us at the same time. 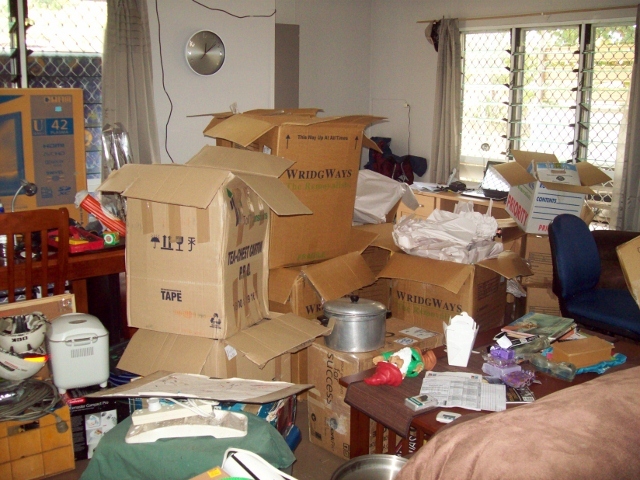 It was really good of our tenant Katrina to let us stay, and I think it did speed up the packing process. 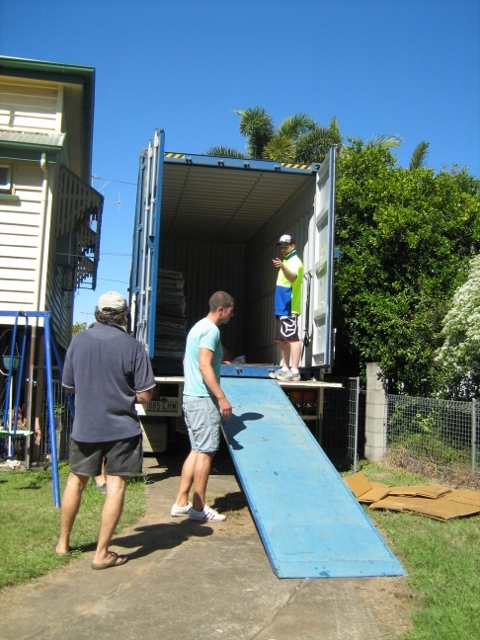 As part of Chris's relocation we were allowed 30 cubic metres of freight for personal effects. 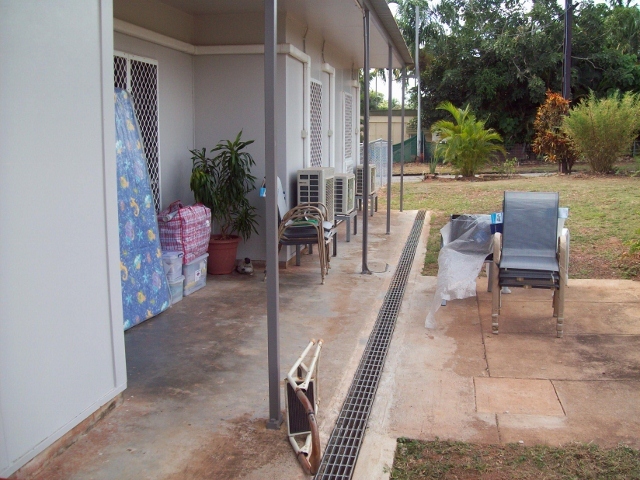 As the house in Nhulunbuy was fully furnished (lounge, 2 x recliners, beds, bedside tables, coffee tables, dining table, fridge, chest freezer, washing machine, microwave) we really only needed personal gear so we would never come close to our allocation. 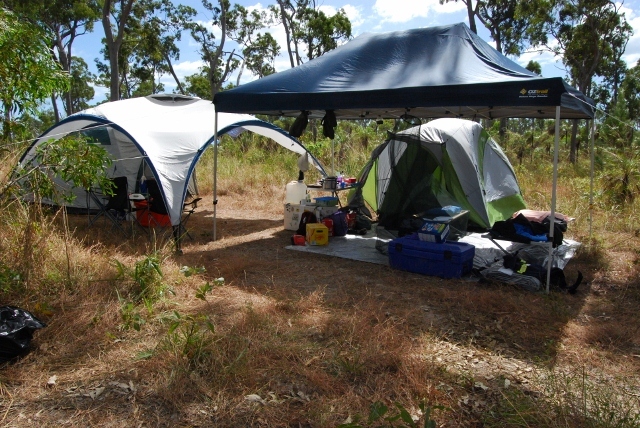 We also did not want to send up too much gear that we would want to bring back as the NT Education Dept has a very strange ruling that they will relocate you, all expenses paid from anywhere in Australia but at the end of your employment they will only relocate you back to Darwin. Go figure. 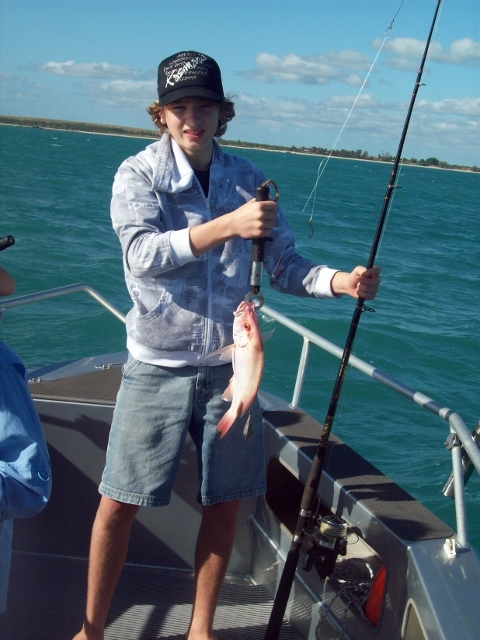 That is of very little help if you are not from Darwin. We believe the rationale is they want to keep people working for the NT Govt. Not sure if it actually works or just inconveniences a lot of people. I am sure it is nothing more than just a cost cutting exercise. Yes, you could call me a cynic. So our plan is to mainly take up gear that we can sell to other residents prior to our eventual departure, whenever that may be. The amount of gear that we will want returned to Bundy will hopefully be minimal and we will probably pack it up into cardboard removalist boxes and send back on a Greyhound bus. Well that is the plan anyway. So we got the van all set up and opened up all the sheds. Chris had a wish list of things we needed. Somehow we had to find as much as we could and make it all happen. 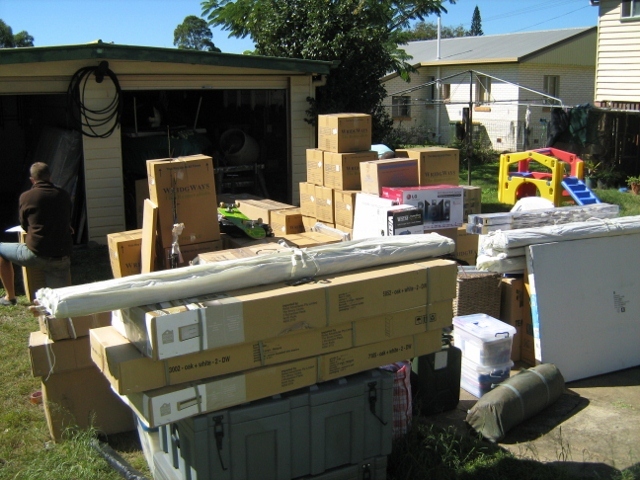 Once we had everything together I then had to submit the removalist request online and sit back and wait for the 'Uplift' to be approved. Then we had to arrange a date for the uplift to take place and we had to be present when it actually happened. How long was all that going to take!!!!!!!!!!. 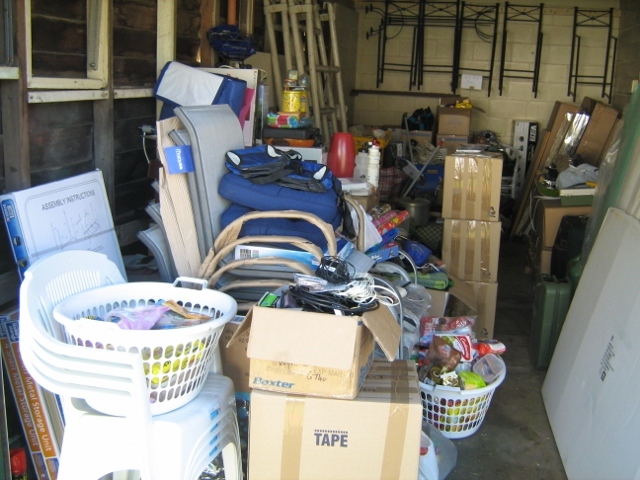 It did not take long to pull all the gear out of the shed and work out what we needed to take. 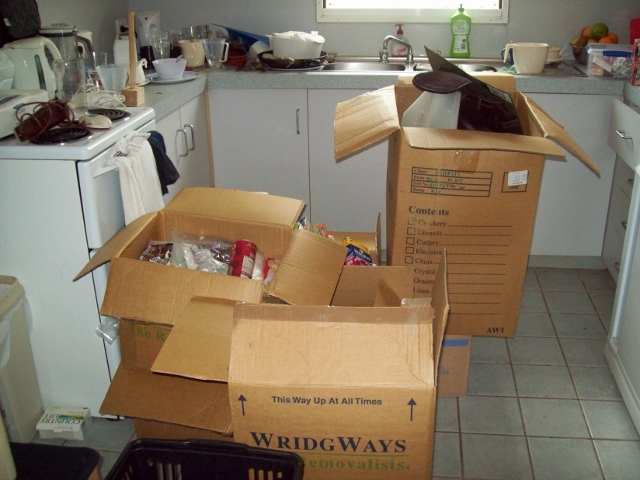 We opened scores of boxes, sorted through them and repacked and resealed them. It was great having the new shed that we had just built to house the caravan as we had plenty of room to spread out, in comfort and out of the sun. Then we had a huge list of things we needed to buy. 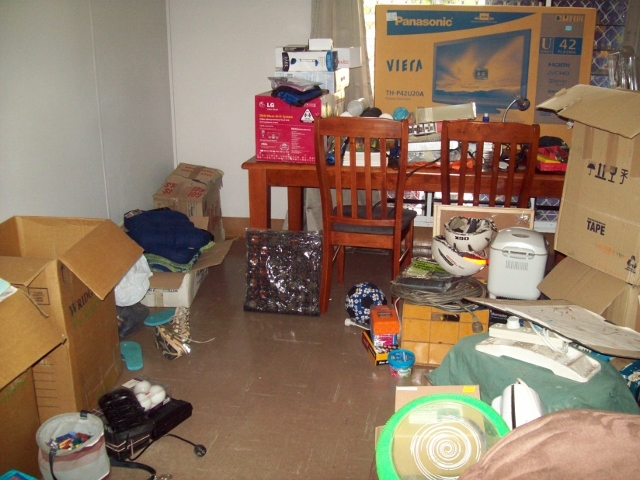 TV cabinets, sideboard, outdoor settings, whipper snipper, three new bikes and associated equipment, work bench, spare mattress, trampoline, clothes dryer, electrical appliances, gardening gear, sprinkler equipment as well as mountains of washing powder, washing-up liquid, liquid soap, shampoos and more, more, more. We only had one chance to get all the gear we needed sent out (for free) so it was important we got it right. The house that we had been allocated was very nice but not huge so we were also mindful about not taking too much stuff, as we did not want to be overrun with gear. We took our boat out of one of our garages and slowly started to fill it with all the gear to be uplifted. The amount of gear continued to grow as the days went on. 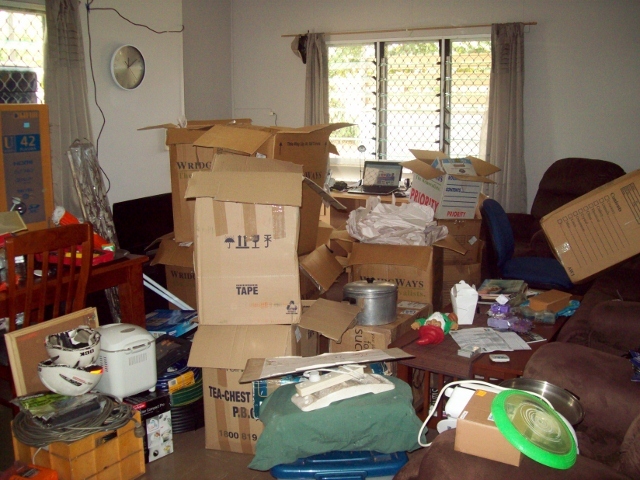 Plenty of flat packed boxes, the new TV, the new stereo and all the other things we bought in Tassy. I actually found the entire process of trying to find gear and having to go out on my own (with Harry of course) but without Chris to be rather difficult. 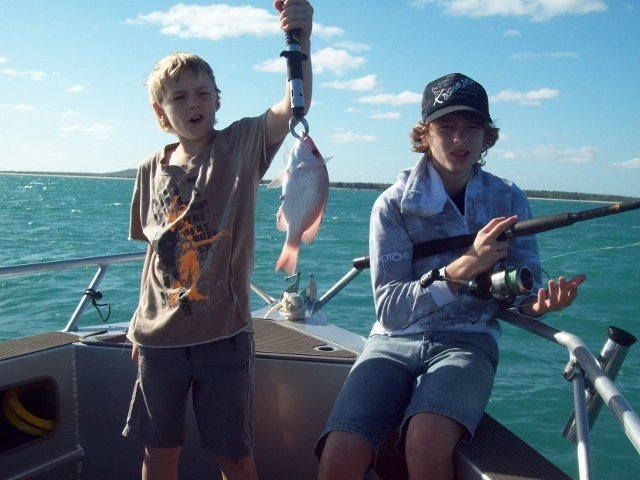 Harry was missing his big brother and his mum and while he never complained I did feel pressured to get it all finished and to get both of us up to Nhulunbuy ASAP. Finally we had all the gear in one place and I submitted our application. 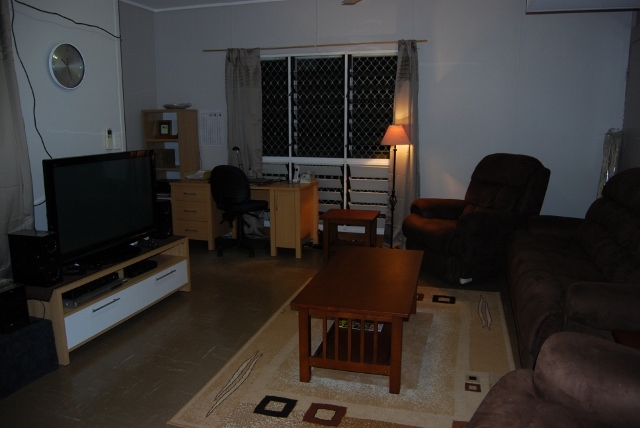 Luckily the lady in Nhulunbuy who arranges the relocations was excellent and she had it approved almost the same day. I estimate we had 17 cubic metres, but had no idea how accurate that would be. The tenders went out and we had confirmation and an uplift date which was only a few days away. We were so lucky that it all fell into place so nicely and it went ahead without a hitch. While we were waiting for it all to happen we had to clean out the van, mop, polish and scrub out the fridge. Then the outside of the van had to be washed and the van put in the new shed for the first time. This was very exciting as we have waited a few years to get this shed sorted. Backing the van in was going to be very tricky and it was a difficult angle and very limited space in which to manouvre. I thought I would give it a go with just Harry directing the procedure. If that failed I was going to get Kelvin or Ross to give me a hand. We had a couple of attempts to get the van in and it started to look like it was going to be very hard indeed. Harry had a few ideas on the subject and bugger me we got it straight in, perfectly straight and hugging one side, just as I wanted. The van looked great standing proudly in its new safe and secure home. What a relief. Relief that we got it in and relief that it fitted. We then shifted into the Joiners house (again) and Jemma kindly gave up her bed for us. Downside was Harry and I had to share one double bed. Now that was an experience. He kicked, thrashed and flapped his arms around all night. Did I sleep well, no not very well at all. We only had to wait a few days and the uplift took place and was all over in a few hours. It was all carefully packed into boxes and then into the container. They said my estimation was fairly accurate and would have been about 15 cubic metres. That was on a Wednesday and we had our flights booked for the Friday. Bundaberg to Brisbane, Brisbane to Cairns and then finally Cairns to Nhulunbuy. Finally that chapter was drawing to a close. 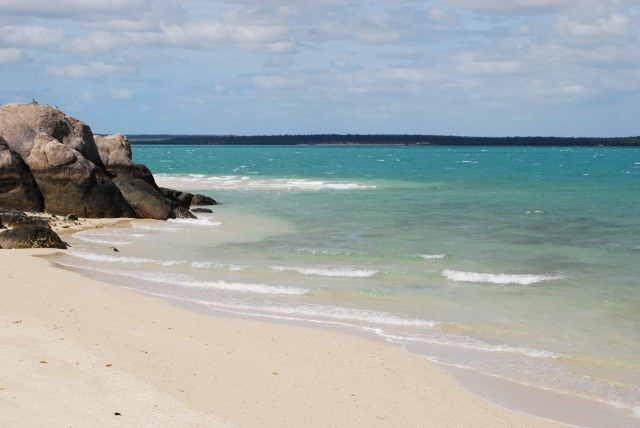 From when Chris and Alex left us in Launceston to when we arrived in Nhulunbuy was only 2.5 weeks. It seemed like two months and it was hard to believe how much we did, waiting to catch the Spirit of Tasmania, driving up, getting all the gear together and then flying up, all in such a small amount of time, just over two weeks. Flying up was a big day with us leaving at 0900 and not arriving in Nhulunbuy until nearly 8-00pm, but we were there. But who was not there, Alex and Chris. Harry and I stood around like Nigel no friends and finally, in they ran. They had got lost, or so they said. (It was pitch black and a fair drive out of town - Ed.) Pretty ordinary effort we thought!! After a short drive (that did not look too difficult a trip???) we were in our new home after a quick drive around to show us town. The house looked just like we expected, a little small but very comfortable, and the best part of all, we were all back together again and we had our own toilet, control again over the toilet! Meanwhile, in our absence, Chris and Alex were busy getting settled in to their new surroundings. Chris's job was very hectic with a lot of extra hours needed to be put in to make life bearable during the school day. It's been quite some time since Chris has worked at a full time job of her own, not just a relieving job. Alex also needed to get to school, so it was easiest to enrol him at the High School (where Chris works) and see how he goes. There was lots of paperwork to attend to - changing rego's on the new car, new licence, liquor licence, housing paperwork and local permits, as well as endless job related forms to fill out. Also numerous phone calls back and forth with endless requests for shopping items that were either too expensive to buy here or were just not available. Lots of jobs for everyone!! 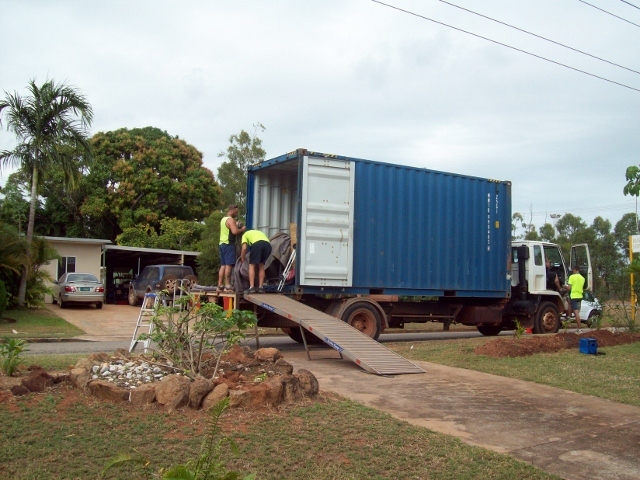 Our container was not due to arrive for nearly four weeks so we had a long wait with very little gear. The time went very quickly. We got Harry enrolled in the local Christian school which he loves. We chose that school over the public primary school purely due to the size difference. The public school has over 700 kids and as Harry has never been to a school full-time (except for his Prep year) we thought a smaller school might be a good way to get him re-acquainted with a new learning environment. We were all kept rather busy in those first few weeks. Chris was still finding her feet as the new kid on the block at school. She is really happy there and gets on very, very well with her teaching partner. 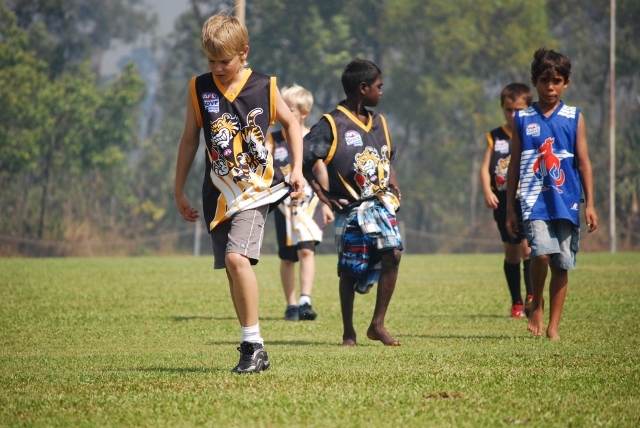 The kids were also finding their feet at school and starting up new sports, while I was running around being Mr Mum. I could not believe how busy I was. Dropping everyone off at school, dishes, washing and cleaning as well as doing the shopping. Then before I knew it I had to pick up Harry and then the after-school sports began. On top of all that I had to get the yard in order, plant new trees, prune and build garden beds. Then I had to do some work on our little Hyundai, get the phone connected as well as the internet. Boy was I busy (but I did find time to natter to the neighbours over the fence). While on the subject of neighbours, we only have two, one behind us and one over the road. They are brothers (both married with kids) and great and will do anything to help out. Their wives are really friendly and have made us feel very welcome. We have the yard slowly coming together and are getting lots of comments about how good it looks as we have discovered the previous tenants (of 16 years) never stepped foot in the yard and it looked like it. 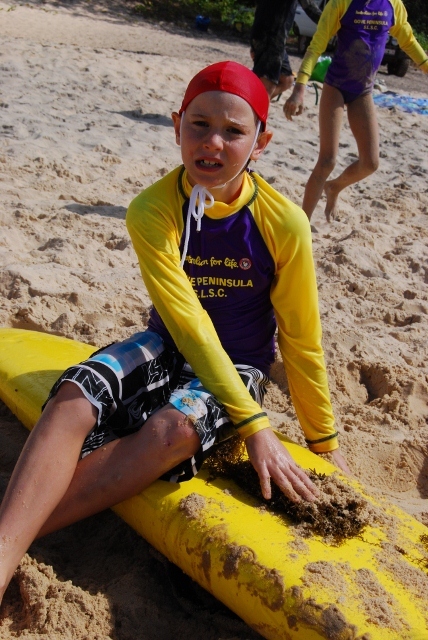 Harry at Nippers and Life Saver Alex on duty. I feel so safe!! 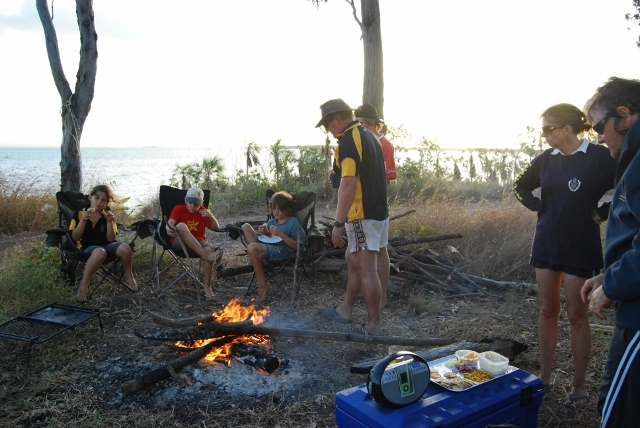 The boys have taken to the Nhulunbuy lifestyle with gusto. 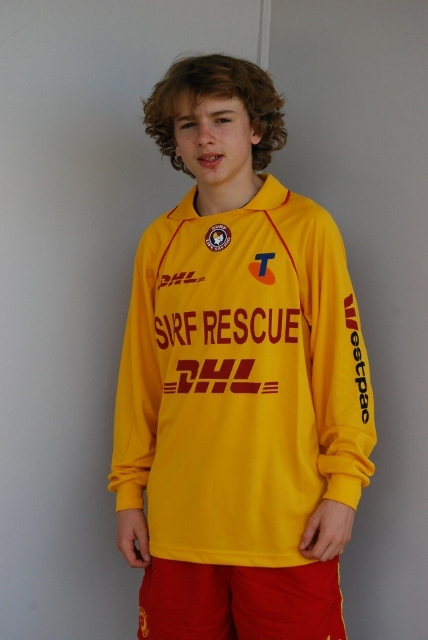 Alex has just completed his SRC (Surf Rescue Certificate) that took three full weekends and he is now on a surf life saving patrol roster. 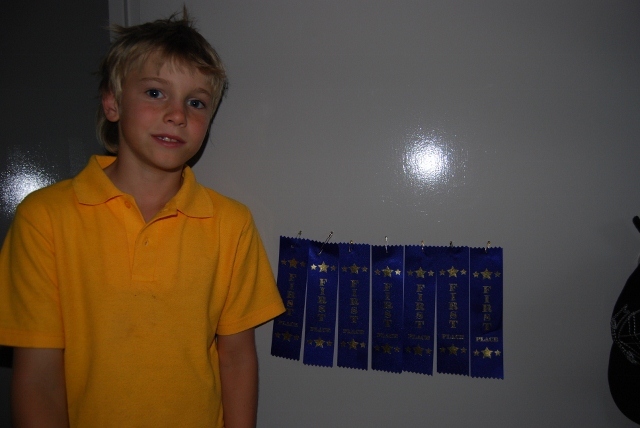 He is playing soccer and doing Tae Kwon Do training twice a week and wants to try his hand at rugby league when soccer finishes. 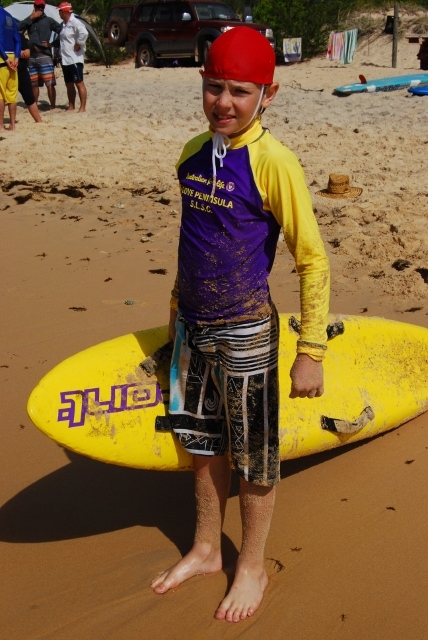 Harry is doing Nippers (at the surf club), playing AFL and is about to start Tae Kwon Do and tennis. Chris thinks she is 21 again and is playing netball. Bring on the injuries. We have all joined the Surf Club and Chris and I are volunteering doing bar duty every month. It is a heap of fun and a great way to meet people. I thought I had best start to look for a job as being at home all day everyday would become a bit boring after all the initial jobs were complete. I had spoken to two different ladies at the end of last year about jobs, one who works for the Govt and one who works for a NGO (Non Govt organisation). Firstly I made an appointment to see the NT Govt health lady who manages the local aboriginal health services. Chris and I had a firm plan that was non-negotiable. I was only going to get part time work as we wanted all the school holidays off together so we could take off and do things while the kids still wanted to hang around with us. I did not want to do any weekends and certainly no call. I was over the call thing and am definitely not interested in it at all. 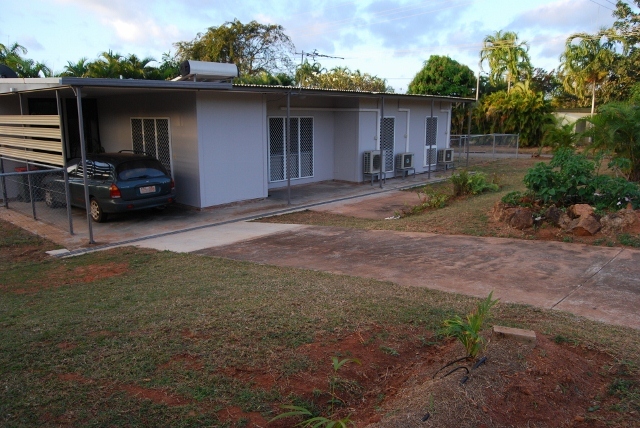 So in I went and she offered me all the relieving work at Yirrkala Health Centre which is about 15 kms from town. That sounded good, but how much work would I actually end up with? I then went and spoke to Miwatj Health which is a very large aboriginal health organisation that has numerous health clinics in town and all over Arnhem Land. Again I told them what I wanted and my reasons. After an hour of chatting about Tasmania, travelling and life they put forward a proposition. They offered me a full time job, no weekends, no on-call and all the school holidays off. Bloody hell, now what do I say? I stuttered and stalled and finally said, that would be great. A handshake and it was all over. 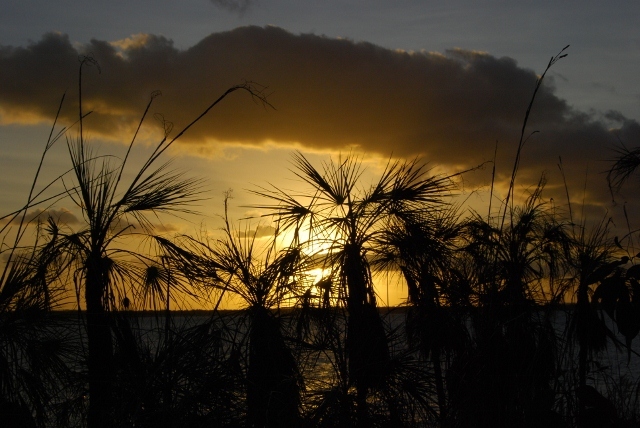 I was now employed again, but not until we had returned from our trip to Cape York in July. 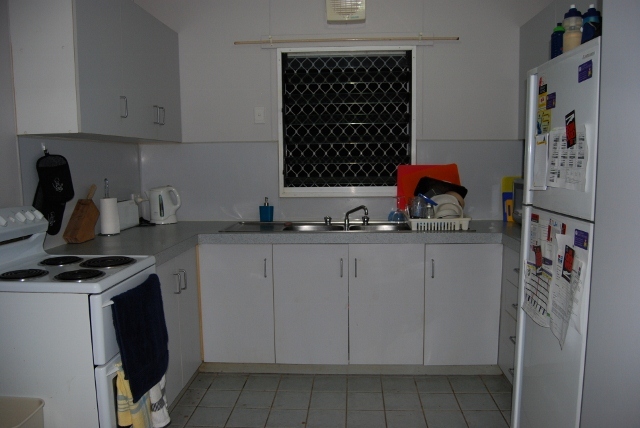 Then I had to front the NT health lady and tell her what I had done. She was great, really understanding and has kept me on her books, just in case. How good is that. It appears the job will be very flexible, is only a 10 minute push bike ride from home and pays well. I think I have again been kissed on the arse by a fairy. Over the next few weeks I did the garage sales every weekend and we picked up a few things we needed, including my favourite, our Deep Spring water cooler with the big bottle of water on top. It is great, is icy cold and the kids (and me) are not in the fridge every 5 minutes. We bought a near new Hoover baglesss vaccum cleaner that was useless (not happy as we paid $80-00) so I rang Hoover and complained how bad it was. Bugger me they sent me a brand new bag vaccum cleaner and included a couple of bags of bags for the inconvenience they had caused. How good is that for service? No receipt and still got treated like a customer that they cared about. Good on you Hoover. Everyone out there, go buy a Hoover appliance as they really understand the meaning of after sales service and looking after the customer, even after they have your money. 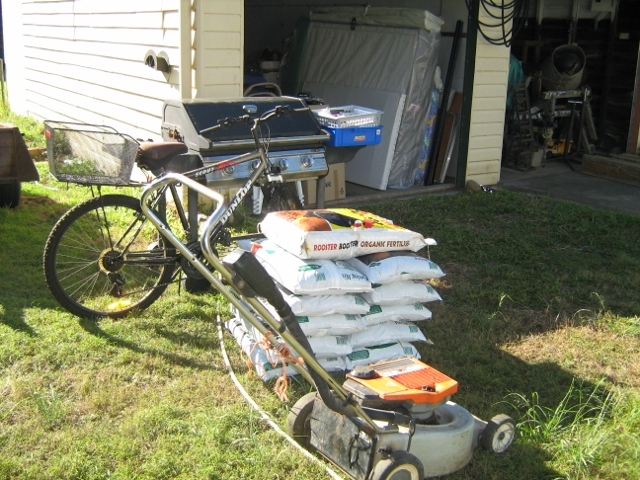 I also picked up a brand new 4 stroke mower for $5-00 (yes, that is right $5-00) as the guy had it shipped out and it would not start (freight is so expensive it is often not worth sending things back). For that sort of money it was worth having a play with. I took it home and told Tom (my neighbour of the decade) about my purchase. Bring it over and let's have a look, he says. We pulled the carby off and cleaned it but it still would not start, but did backfire. A little more detective work and we discovered the tapered locating pin on the flywheel was broken, so Tom made a new one, in it went and it started on the first pull. It was a two beer job and I was out mowing the lawn. You would not believe it but just as I was mowing the footpath, with the mower purring like a baby, the guy I had just bought it off an hour earlier drove past, with his jaw hitting the deck when he saw his mower, finally full of life. I must say I did feel a bit guilty, but I did take a bit of a gamble (a $5-00 one ) that it could be fixed. Always good to know someone with a nice boat. Fish a-plenty. The odd fish or two. This is fishing heaven! A few weeks into our time in town we also met a nice family who only live a few houses away. Col is in charge of the fire station and is friends with our good friends, the Murphys from Darwin. 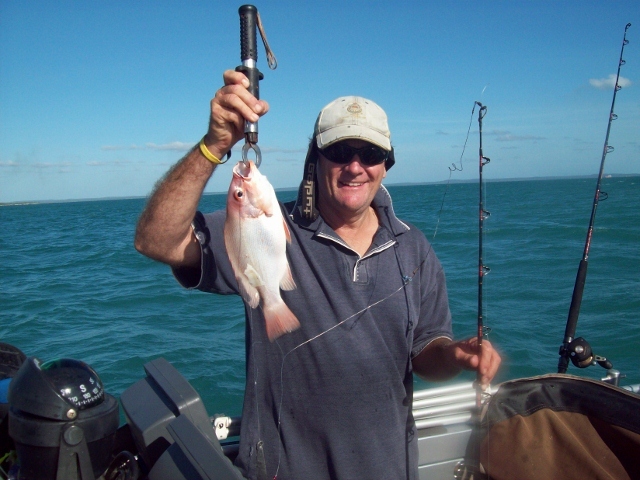 They have a sensational big fishing boat and have had us out with them a few times. This place is fishing heaven. 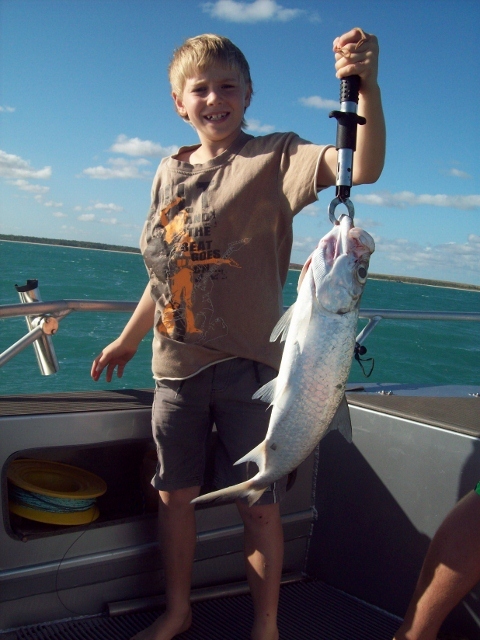 The number and size of the fish we have caught has been amazing. Our huge freezer is slowly starting to fill. 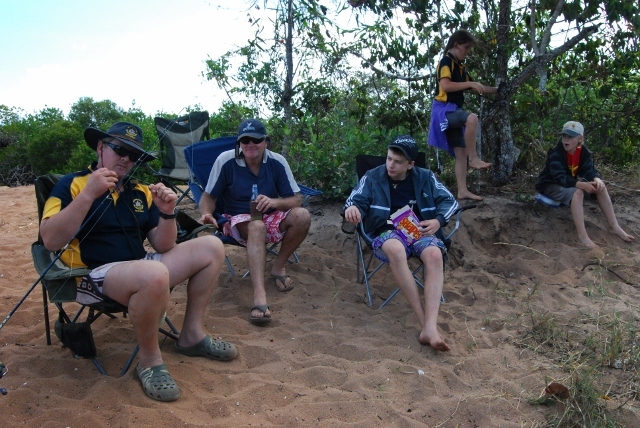 We also had a long weekend camp with them to North Beach which was also great, but unfortunately a bit windy. 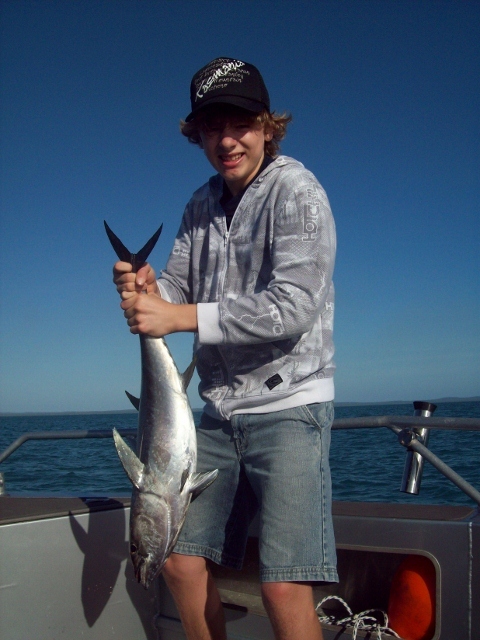 We did not get out in the boat as much as we had hoped but on the one trip, still a mountain of fish were caught. 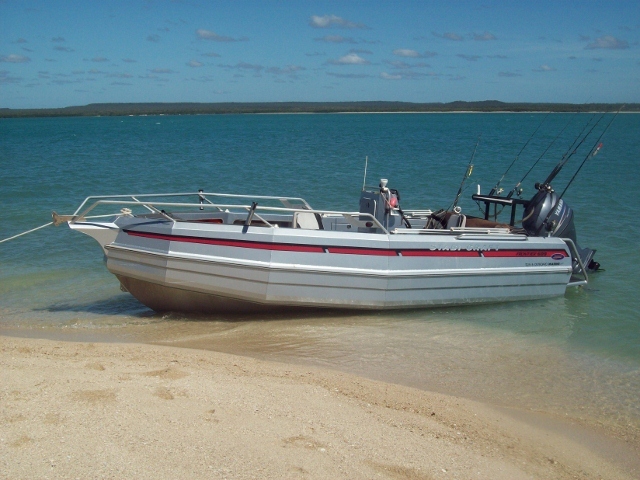 We are now definitely in the market for a boat, looking at around 5.8 to 6.3 metre aluminium with at least a 115hp Yamaha or Honda 4 stroke outboard, centre console. 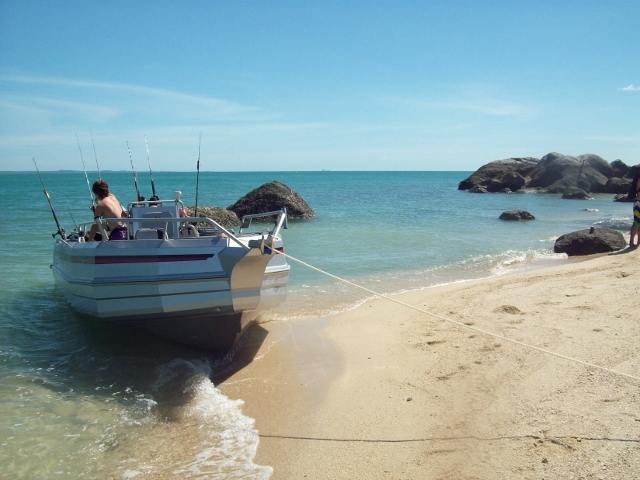 There are plenty of boats around, just have to wait for the right one to come up. 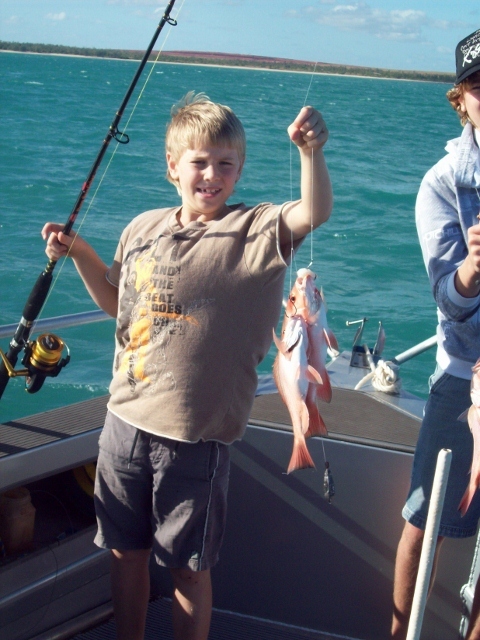 It will be great to be able to get out most weekends and play around, fishing, camping and exploring. The waterways around here are amazing, islands everywhere, all with small private secluded beaches, many with oyster covered rocks. Yum-O! Finally it arrives. I hope it all fits?? The house and yard now complete. Time to enjoy. Finally our container arrived. 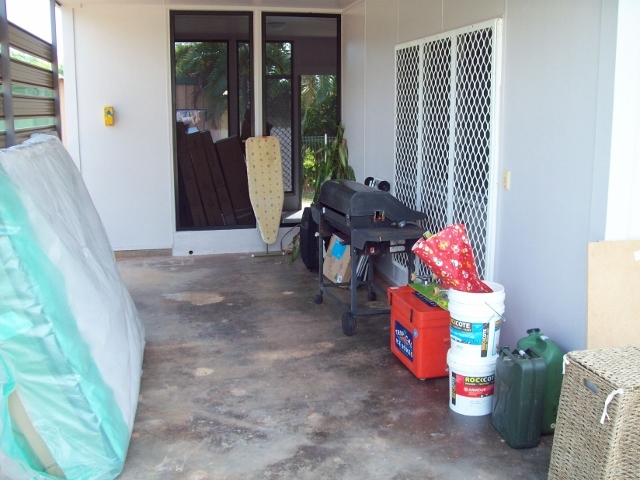 The guys unloaded it all, mostly into the carport and I then worked out where to put it all. Over the next week I unpacked boxes, washed a million kitchen things, made flat packed furniture, put bikes together, made the workbench and shelving and sorted out the shed. The house was really starting to come together, in fact it was starting to look like a home. Our major furniture issue in the house was the size of the dining room table that had been supplied. It is bloody huge. Like so big that Chris is unable to hear what I am saying when I am sitting down the other end (she thinks that is actually pretty good). It dominated the room. I put a 'wanted' ad in the Nhulunbuy face book notice board for a round dining room table. Well bugger me a lady rings me, has a round table in excellent condition with 2 x chairs (we don't need chairs as the mother of all tables has six chairs) and she only wanted $80-00. It looks great, fits in so well and we can actually hear each other when we are all sitting around having a meal. 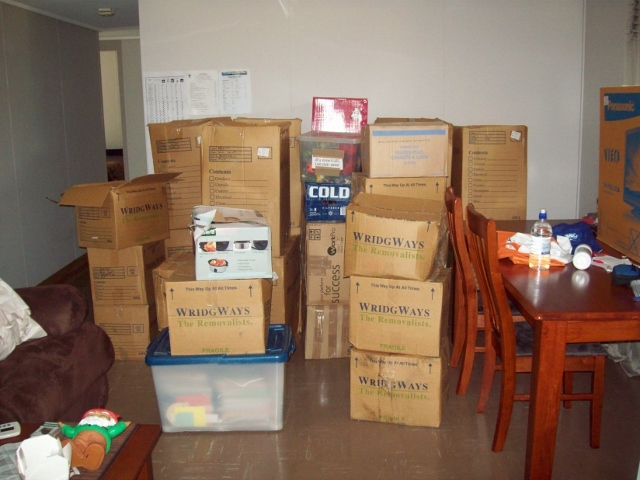 So finally there were no packing boxes lining the hallway. Everything had a place, cupboards well stocked, unpacking complete. Chris was actually happy with what we had brought and luckily not much was unwanted. You have to be happy with that. 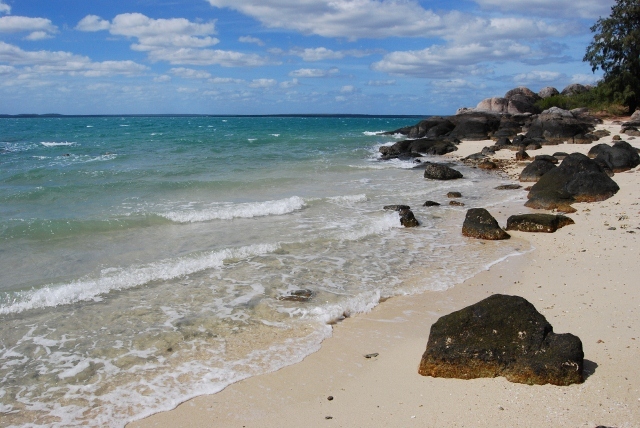 I think life in Nhulunbuy is going to be good, really good. 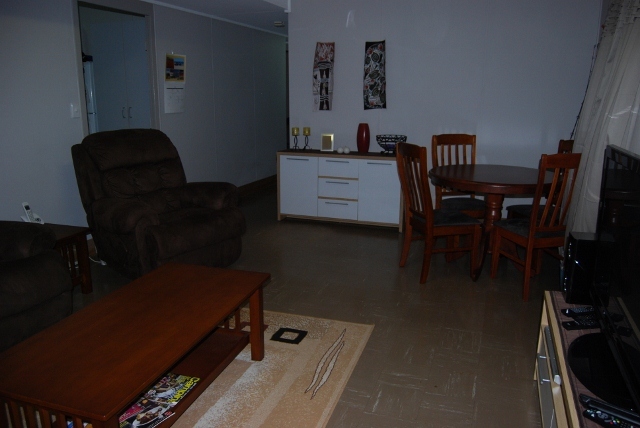 It is remote, is exciting but has a few luxuries like Woolworths, pubs and restaurants. It is kid heaven and the boys could not be happier. Alex rides to school, Harry gets the bus (the stop is right out the front of our house) and all are happy. 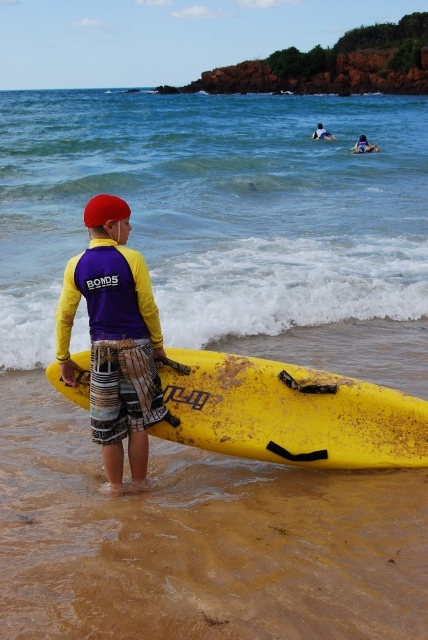 For kids to have a bit of freedom is brilliant. Just like the childhood we had many, many years ago. 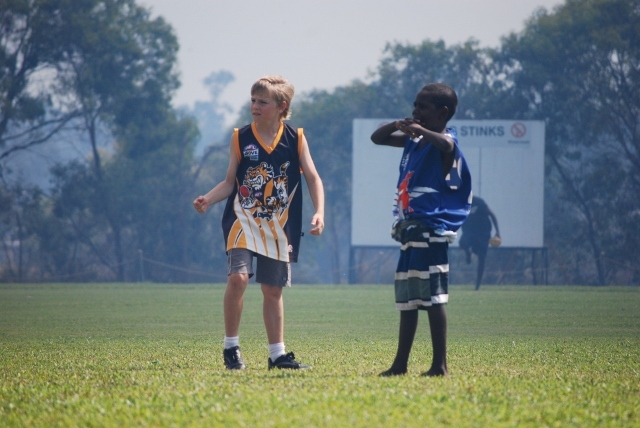 Harry the AFL star hard at it. He actually is not a bad little player. So what's next? 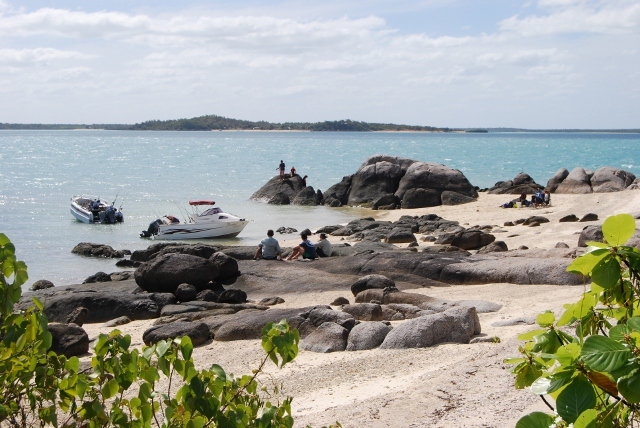 Cape York. 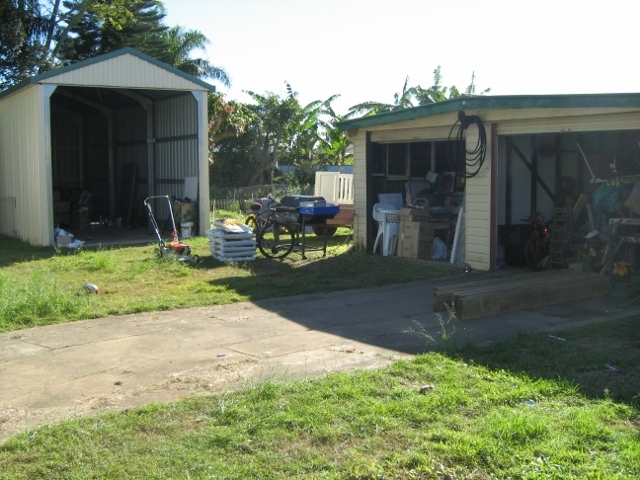 I will be flying back to Bundaberg to get the car and camper and then driving to Cairns to meet the rest of them when they fly in. 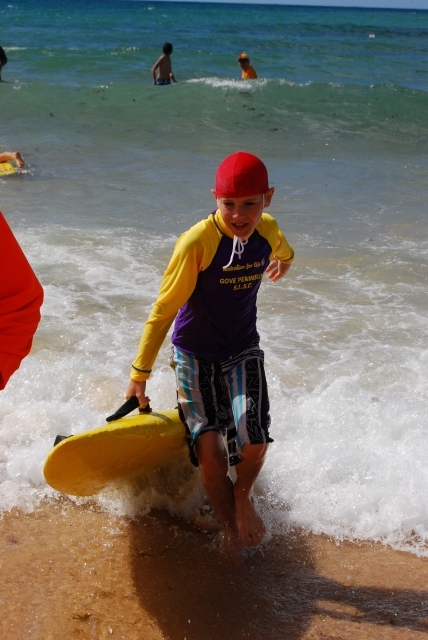 Really looking forward to the Cape and to visit our 5th and final extremity of Australia. It should be a hoot.